The following customer lived in an 1890’s property with traditional timber sash windows. The house was located in a terrace row of period houses. Many properties in this road have had the original timber sash windows removed and replaced with modern out of character PVCu windows. The customer approached us stating that two window companies had told her that the windows were rotten and required new modern windows. The customer asked if we were able to restore her timber sash windows as she was desperate to retain the character of the property. Following our initial survey it was clear the windows were in a state of disrepair, but were fully restorable. After producing a detailed quotation and survey the customer decided to place an order with us to have them restored. The windows were typical of sashes of that age. They suffered rattling sashes, draughts, flaky paint, failed putty and sills that needed attention. Often customers forget sash windows have lasted 100 plus years and often it is only minor repairs that are needed to restore them. The seasoned timber used 100 years ago was of exceptional quality. The sashes were removed and initially the box was fully restored. This involved removing all the paint and identifying areas of repair. The sills were repaired and parts of the box that had decayed were also repaired. The sashes were also fully stripped of their paint and various repairs were undertaken. This involved repairing failed joints, replacing loose or crumbling putty and carrying out repairs to the frame and glazing bars. The windows were fully decorated whilst the sashes were out. This involved a primer, undercoat and topcoats of special sash paint with a 10 year guarantee. This is a unique service we offer to ensure the entire box is protected rather than just the parts a painter can see. The windows were re assembled with new cords and new modern beads that contained a concealed Teflon draught proofing. 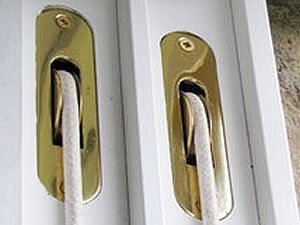 This prevents the draughts and also eliminates rattles. New furniture was fitted and the concrete sills were also restored. The final photographs show just how a window that had been condemned by two other window companies can be restored to their former glory. The customer was so impressed with the transformation she had these works to say. It has also been the customer’s mission to recommend our service on. As a result four other jobs in that road alone have been completed by us as a result of the customer’s high praise. Our timber sash windows were in a very poor state. We struggled to open them, in fact many were totally sealed shut. We had an awful problem with condensation and because the putty on the outside was so poor and crumbly, we had a very bad case of black mould/mildew growing on the inside, which we struggled to get rid of. We called several companies in, some that were meant to restore, some that were going to entirely replace. The company I had in to quote before Mark had said that the windows needed to be replaced as they were totally rotten. As you can imagine we were quite shocked by this as I thought they needed a bit of love, but not replacing. Mark came round to quote and was just lovely. He made it very clear what could be done to get them back up to scratch. Did not seem fazed by the job and was very quick at sending across a clear and comprehensive quote. The team working on the windows were very professional - they carried out the work as cleanly and efficiently as possible. I was off work with tonsillitis for one of the weeks and also looking after a 1 year old, so the thought of dust and workmen in the house was not ideal. They really were so mindful of the situation and totally respectful of our home. As for the windows themselves, we are unbelievably delighted. 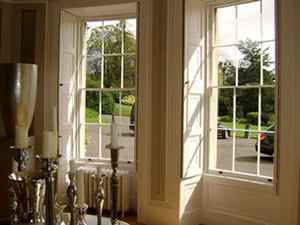 We have been left with our beautiful, fully operating windows that look as good as new. No, they're not new windows and we don't have double glazing, but in my opinion what we have is better. We have charming, 100 year old sashes that give our house character. And they work! It also ran right on time and to budget. I've since had other work carried out in my house and I think having Mark and the team in the house beforehand has set a rather high precedent. They were just very clear at communicating - explaining what was due to happen that day, what would happen next etc. Trust me, that's not always the case. I have since asked Mark to restore our door frame and replace our new front door once all the works have finished on our house. The job they carried out was actually much more than my husband and I could have ever expected.